The History Museum at the Castle collects and studies information related to the life and career of Harry Houdini who claimed Appleton, Wisconsin was his home-town. The A.K.A. Houdini exhibit lets you experience some of Harry Houdini's tricks of the trade through hands-on activities. It's fun for the whole family! The Museum offers annual events including live summer theater and Halloween with Houdini. A Houdini walking tour map with articles and magic tricks is available at the History Museum for 25 cents. Many researchers have used the artifacts and archives at the Museum, including the Discovery Channel, the Arts and Entertainment Network, the BBC, Wisconsin Public Television, and the Learning Channel. Since it opened in 1989, the exhibit has welcomed visitors from all 50 states, and from over 35 foreign countries. The Houdini Museum in Scranton, PA is the only museum in the world totally devoted to Harry Houdini. The museum hosts tours, mystery theaters, birthday parties and numerous magic shows throughout the year. There are Halloween shows during October and an official Houdini Halloween Seance on the web. 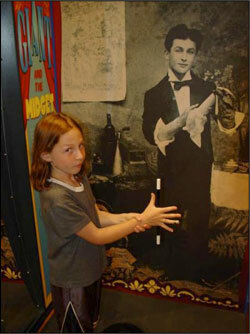 The Houdini Museum covers Houdini's career and facts about Houdini not found in any other museum. The Houdini Museum has national and international significance, especially since the tragic fire of the wonderful exhibit in Niagara Falls in May of 1995. Each year, visitors from all 50 states and countries all over the world visit the museum.